The leaked photo from last month, revealing the possible name of Universal’s newest park. 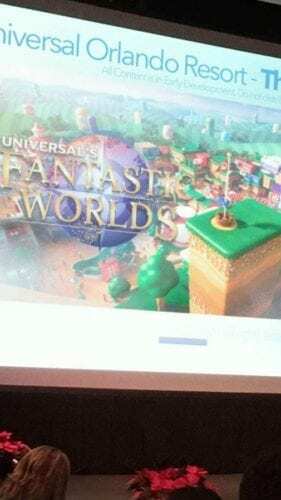 This past December, a photo circulated on Twitter that appeared to be a slide from the aforementioned Comcast town hall, depicting previously unseen art and the rumored name for Universal’s new park, Universal’s Fantastic Worlds. This new document shared by Stella was meant to accompany that presentation. A pieced-together version of the handout, as organized by Stella. In the handout, the initial paragraphs list Universal’s parks around the world, mention revenue, and the “continued success” of The Wizarding World of Harry Potter in Hollywood, Minion area in Japan, and Volcano Bay in Orlando. The document goes on to say that Universal’s “major competition” in the theme park industry (likely meaning Disney) has not had much “aggressive competition,” saying that Comcast will increase its investment in the parks over the next five years. At this point in the document, we get to the new details on Universal’s yet to be announced park, Universal’s Fantastic Worlds. From this paragraph, it’s clear that Universal is seeking to create a whole new experience with this park, with the goal to create an immersive experience that will make guests want to visit and stay for an entire vacation, rather than just make a quick stop. 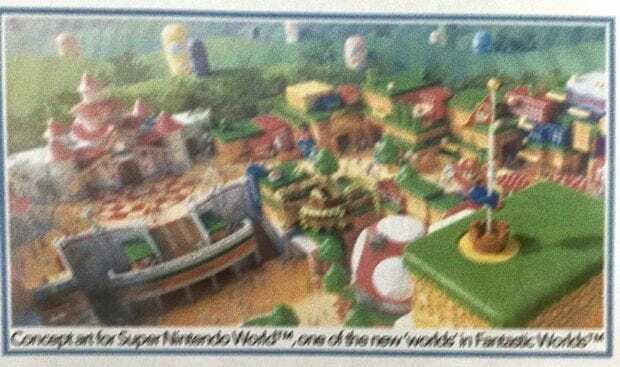 It also mentions that the park will be built with large expansion areas to allow for the ‘World’ of any movie, TV show, video game or other media to be included in the park. Normally, theme parks will include expansion room for single attractions – but the thought of leaving room for entire theme lands? This could help keep Fantastic Worlds fresh and relevant as the pop culture landscape changes over time. This revelation brings many questions to mind, as this new hub and spoke design will be a first for Universal parks. With each world offering its own “portal” to enter. This could mean giant TVs, books, or other massive structures to serve as our passageway into these brand-new immersive worlds. The new themed areas come as the result of a global partnership between Universal Parks & […] Nintendo – two icons of the entertainment world. We can’t wait to reveal more of the new park in the next few years. We certainly share that sentiment! This park seems to want to take immersive theming in this industry to the next level. 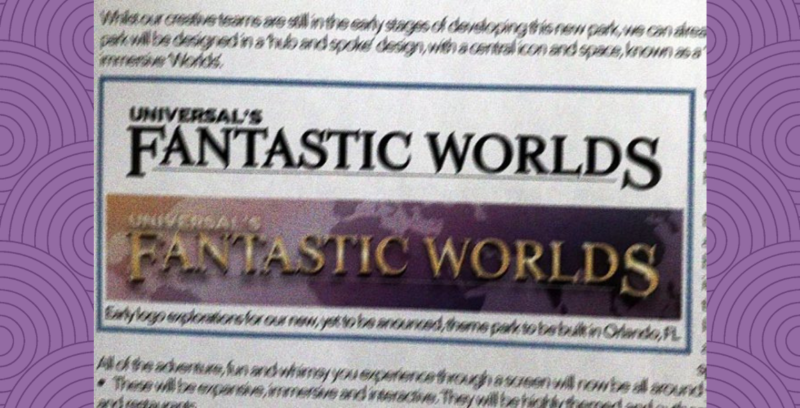 But will it be named “Universal’s Fantastic Worlds”? According to someone on InsideUniversal, this name could hit a roadblock in the future, due to a filing from Warner Brothers. 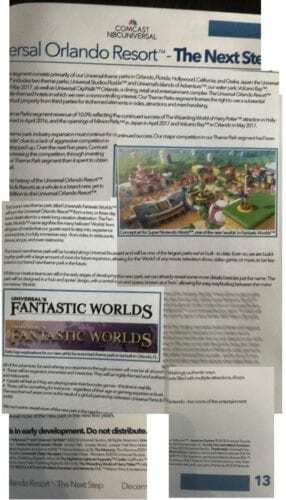 The studio has recently filed two extensions on the “Time to Oppose for Good Cause” related to Universal’s trademark of the “Fantastic Worlds” name. There has not yet been a formal objection to the name, so only time will tell if “Fantastic Worlds” becomes the new park’s official title. Despite all this new information, we’re still in the early stages of learning about this new park – and it hasn’t even been announced! We still have so much to learn. Do you have any more insight into Universal’s Fantastic Worlds, or corrections to our information above? Leave a comment below, email info@attractionsmagazine.com or send a direct message on Twitter.